Eric Forstmann studied at the School of the Museum of Fine Arts in Boston under the tutelage of Barnett Rubenstein and Henry Schwartz. In addition to his many solo exhibitions, he has had five one-man shows at the following institutions: The Butler Institute of American Art in Youngstown, Ohio; The Kemper Museum of Contemporary Art in Kansas City, Missouri; The Evansville Museum of Arts, History and Science in Evansville, Indiana; and the Mattatuck Museum of Waterbury, Connecticut. Most recently in the spring of 2018, Forstmann had a solo exhibition at the Brenau Galleries at Brenau University in Gainesville, Georgia. He was also featured at the Norman Rockwell Museum in the exhibition Rockwell and Realism in an Abstract World in 2016. That same year, Forstmann was featured in Naples Collects at the Naples Museum of Art, Naples, Florida, alongside works by Andy Warhol, Roy Lichtenstein, and Pablo Picasso. His work has been featured in Architectural Digest, American Art Collector, and many other publications through the years. Litchfield Magazine recently named him as one of the “25 Most Influential People” for 2017 in Litchfield County, Connecticut. Eric Forstmann’s work is proudly held in many public and private collections. The artist lives in Sharon, CT and works in Torrington, CT.
2012 Thea Foundation, Artist Commission Benefit in honor of President William J Clinton. Washington, D.C.
Random Shelf Life (left) will be featured in the ongoing exhibition "Naples Collects" by Artis-Naples at The Baker Museum in Naples, FL. This exhibition brings together examples of high-quality art owned by art collectors from some of the best-known international artists of the past few centuries. Frank Verpooten, Director and Chief Curator, writes of the piece, “Random Shelf Life is part of a series of paintings that elevates common everyday objects to a higher status. 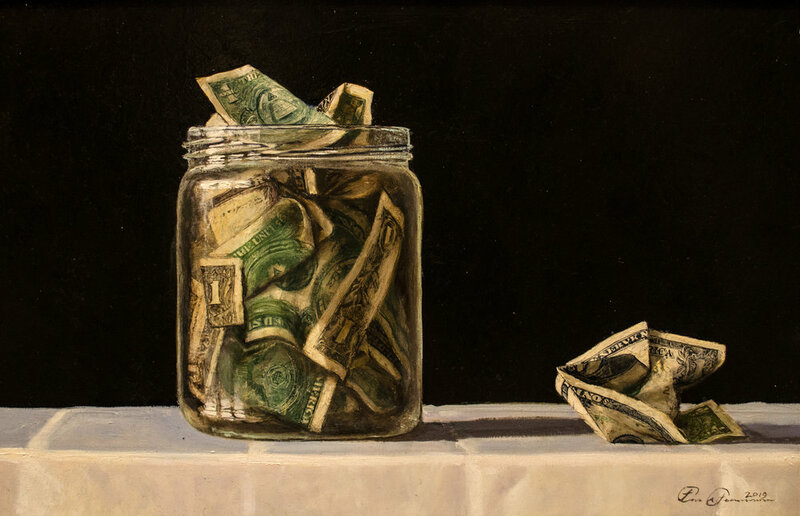 Evoking the tradition of 17th –century still-life painting, each object is depicted in great detail; the dull texture of a plastic container contrasts with the shiny surface of a silver vessel. Adding another layer of meaning, Forstmann includes himself in the image by painting his self-portrait in the reflection of the silver plate on the lower left corner of the work. This painting-within-the-painting recalls the masters of spatial illusionism who also asserted their presence by including self-portraits in a reflection, such as Jan van Eyck’s legendary work in the 15th century.” Also included in this important exhibit are Andy Warhol, Claude Monet, Pablo Picasso, Henry Moore, Norman Rockwell, Alexander Calder, Joan Mitchell and many more. "Naples Collects” is on view now thru June 19, 2016 at the Baker Museum in Naples, FL. We are pleased to announce that Pin-Up Window (right) will be exhibited at the Norman Rockwell Museum in the exhibition Rockwell and Realism in an Abstract World. It is scheduled to be on view from June 17, 2016 through October 29, 2016. The exhibition will be featured during the Museum’s summer and fall seasons. 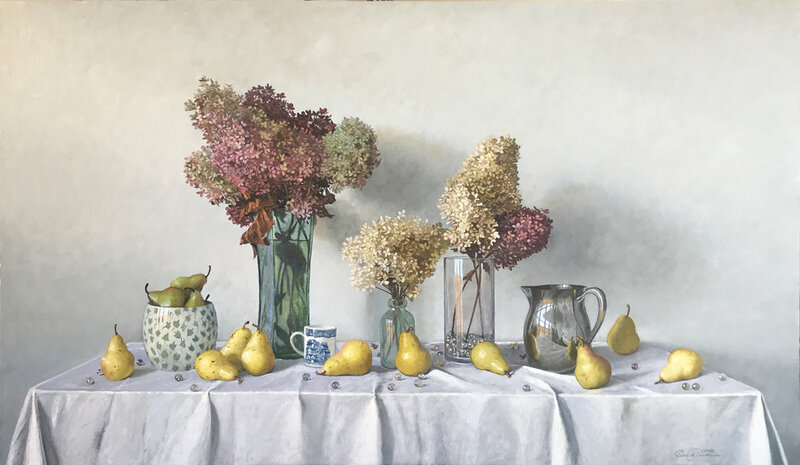 The essence of tradition is to invite the challenge that redefines it, and after more than six decades on the periphery, realism has been reinvigorated by contemporary artists who see it as a way to address the experiences of living in our complex world. 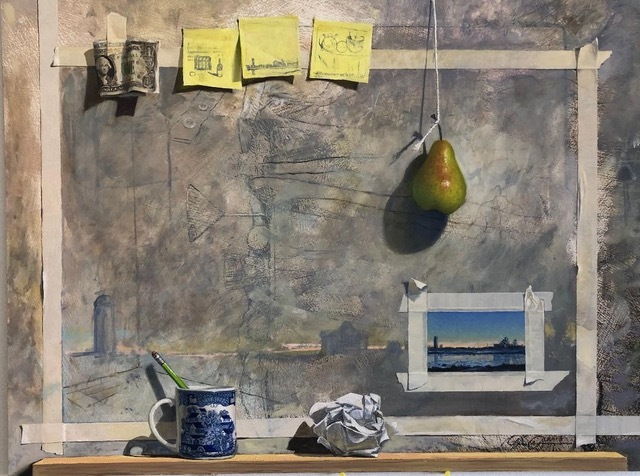 Rockwell and Realism in an Abstract World will examine the forces that inspired the relegation of narrative painting, and especially the art of illustration, to a lesser status by mid-century. We are thrilled that Eric's work is being recognized at such a wonderful institution. Arrangement with Hubcap, 2009 Oil on Board 27.5 x 35.5 inches. Collection of Brenau University, Gainesville, GA. Arrangement with Hubcap (left) is now in the collection of Brenau University in Gainesville, GA. The university is renowned for its important collection and world class exhibitions. The incomparable art dealer and longtime university board of trustees member Leo Castelli (for whom the university's gallery is named) facilitated relationships with iconic artists such as Robert Rauschenberg, Jasper Johns, and Andy Warhol, allowing the university to stock its impressive collection with some incomparable pieces. We are pleased to see Eric in such good company. John Streetman, director of the Evansville Museum, speaks at the opening of Eric Forstmann's show "Seeing Ourselves" at the Evansville Museum of Art, Science & History in Evansville, IN while Eric Forstmann and Jane Eckert look on. The Intuitive Realist by Alyssa Forstmann - a behind the scenes look at the talent and wit of Eric Forstmann.